Ethics & Values | Agile Defense Inc.
Agile Defense endeavors to maintain a positive work environment one in which all employees are treated with dignity and respect. Each employee plays a role in fostering this environment. Accordingly, we all must abide by certain rules of conduct, based on Core Values, and common sense. These Core Values are present in all of our employees and all aspects of our organization. We have always and will always believe our employees are the best; now we can express simply why and how. Agile Defense has been extremely successful in the past few years, all due to our employees and the culture we create together. We believe that several attributes are at the root of our very best employees and our amazing culture. 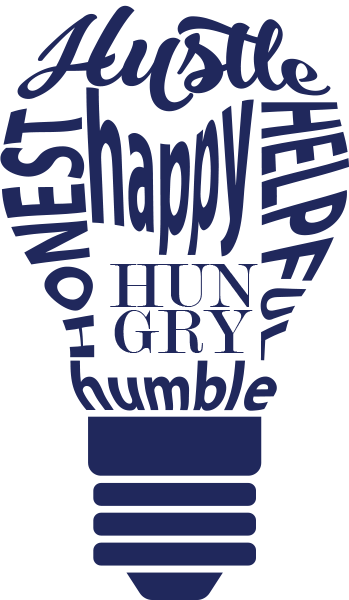 We have named these attributes “The 6 H’s” –Happy, Helpful, Honest, Humble, Hungry, and Hustle. We have seen, many times over, that Agile Defense employees who exemplify the 6 H’s achieve incredible success within our customer workspaces and within Agile Defense. These 6 H’s struck us as so important that we have embraced them as our new Core Values. Happy: We exhibit a positive outlook in order to create a positive environment. Helpful: We assist each other and pull together as teammates to deliver. Honest: We conduct our business with integrity. Humble: We recognize that success is not achieved alone, that there is always more to learn, and that no task is below us. Hungry: We desire to consistently improve. Hustle: We work hard and get after it. Agile Defense understands that ethics covers a wide variety of behavior and conduct. We place specific emphasis on two types of ethics: Ethical Sensitivity and Cyberspace Ethics. Ethical Sensitivity, the ability to be aware of the ethical components in a scenario and to determine if a situation is breaching previously set ethical boundaries, is an invaluable skillset to possess. Agile Defense provides our employees tools to hone their Ethical Sensitivity, to include mandated training modules as well as seminars and speakers where attendance is encouraged. Cyberspace Ethics, or ethics online, is especially important in the interconnected world we live in. From cell phones to work computers, the things we do and search online are under constant scrutiny and provide risk for both the individual and company. Agile Defense provides mandated security and online risk mitigation training – including phishing, whaling, cybersecurity, and other topics – to ensure that all personnel are aware of these threats and conduct themselves appropriately online. Cyberspace Ethics demands knowledge and skill sets from many disciplines – technological, administrative, legal, sociological, economic, and more. To that end, we endeavor to educate our personnel and give them a basic understanding of how computer systems and networks work, as well as explanations of what the norms are, how they affect different stakeholders the rationale behind acceptable and unacceptable behaviors, and an overview of judicial processes and sanctions. These steps ensure that Agile Defense continues to vigilantly lead with integrity and ethics in today’s modern world. Agile Defense is committed to compliance with applicable laws, rules and regulations. We have adopted a Code of Business Conduct and Ethics (the “Code of Conduct”) that provides a statement of fundamental principles and key policies and procedures that govern the conduct of our business. We have established a confidential and anonymous Hotline for the purpose of permitting employees to anonymously report suspected accounting and auditing concerns and ethics concerns as well as to report harassment and discrimination, loss prevention and safety issues, concerns over information security and privacy, operational concerns and violations of laws, regulations or our Code of Conduct. It is the responsibility of each director, officer, and employee to report suspected violations of the Code of Conduct or accounting and auditing concerns. Your message may be left anytime, 24 hours a day, 7 days a week, in any one of two methods listed below. Understanding and acting upon any issues that exist regarding financial, accounting and/or audit matters as well as those relating to the Standards of Business Ethics and Conduct are essential components to Agile Defense’s ability to take action and ensure the highest levels of ethical conduct. The observance of these rules will help to ensure that our workplace remains a safe and desirable place to work.